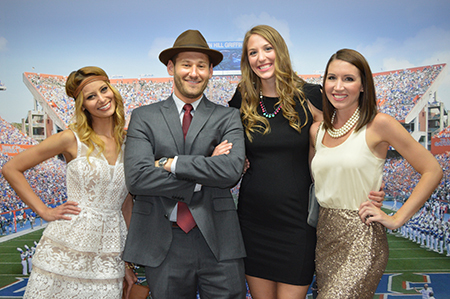 The Roaring ‘20s theme for the 2014 Annual Bicuspid Ball proved that there is truth in advertising – it was a roaring success and a memorable night for the 300 attendees. The Annual Bicuspid Ball is a formal event and all members of the college – D.M.D. students, residents, faculty and staff – are invited. It is traditionally organized by the junior D.M.D. class and serves as the college’s prom. 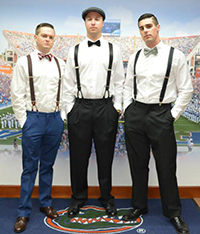 The event featured live entertainment by The Jawbreakers Band, that includes dental faculty, plus dancing, dinner, a royal court, and not-too-serious awards like Most Gatsby-Inspired Outfit and Best Dressed Couple. Matt Dennis, D.D.S., won the award for Faculty Member Most Likely to Make You Sweat in recognition of his teaching efforts in the Student Oral Surgery Dental Center. “I want to share a huge thank you to our corporate sponsors. Their support allowed us to make this year’s ball even better than we could have expected,” said Ann Hoang, D.M.D. class of 2015 and event coordinator. Sponsors included Adec, Aspen Dental, Bien Air Dental, Bio Horizons, Crest + Oral-B, Dental Services Group, Dentsply Tulsa Group, Elevate Oral Care, Henry Schein, Lumadent, Milestone Scientific, Patterson Dental, Practicon, SDI and Surgitel. For more photos from the ball, please check out the album on our Facebook page.